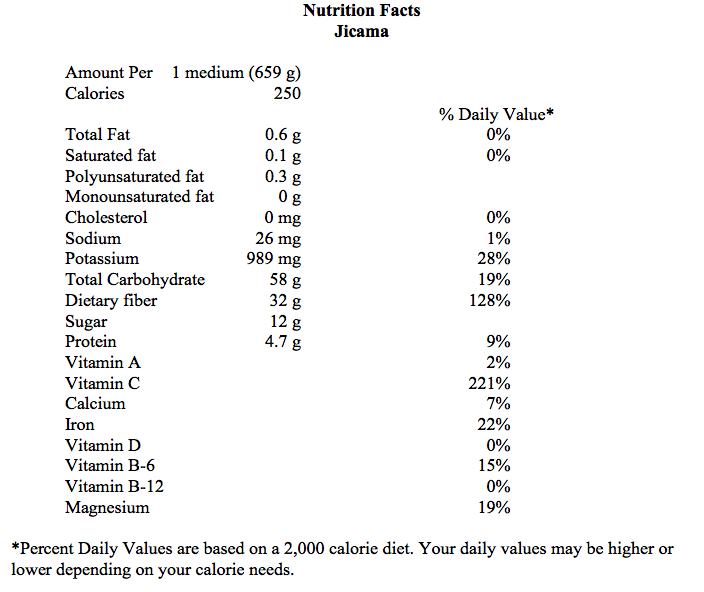 Jicama, pronounced (HEE-kah-ma), also known as a yam bean, is native to Central America. Jicama is a delicious edible root that resembles the shape of a turnip and has a skin that looks a lot like a russet potato. Although the skin is tough and not edible, the white flesh is sweet and crunchy! When selecting a jicama, look for round firm tubers. The jicama will last for about a month in a cool dry place. Once it is peeled it should go into the refrigerator and can last for about 10 days in a zip lock bag. I prefer to peel them and cut the ends off a little to make the ends flat and then I cut the jicama into quarters and then into strips. You can cube them or cut them in different shapes if you like. I have them ready in case I get a snack attack! The natural crunch and sweetness of this root vegetable is delightful, but beyond the taste, jicama is a healthy vegetable that is an excellent source of fiber and low in calories. I value the combination of healthy and tasty. The jicama, like the Jerusalem artichoke, contains inulin which is a prebiotic that promotes beneficial bacteria to the gut and bowels. Some nutritionists say that the jicama can help protect you from osteoarthritis and be beneficial in fighting colon cancer. I enjoy the taste of the raw jicama, with or without a dip. Jicama is perfect on a veggie tray! In Central America it is often served raw with a little lime juice and sprinkle of chili powder. It can also be used raw in salads and is often baked by itself with a little olive oil, salt and pepper or mixed with other grilled or baked vegetables. Jicama is found in many grocery stores and can be bought almost all year long. 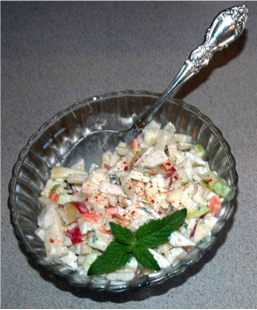 I have included a delicious Jicama Apple Mint Salad along with the nutritional information for jicama. In a medium sized bowl, add jicama, apples and carrot. In a small bowl, mix yogurt, lime juice, sugar and fresh mint. Mix well, add to jicama mixture. Refrigerate to marinade the flavors. How do you like your Chocolate Chip Cookies?